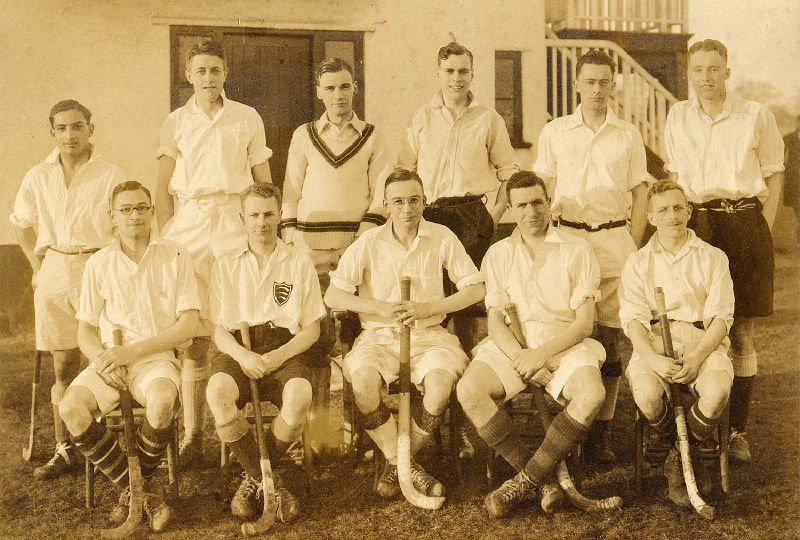 The first official picture of the OCHC – taken at the School match during the 1928-29 season . Until 1916 there were two major sports at Cranleigh; cricket in the summer and football in the winter (although athletics did make a token appearance towards the end of the Lent term). In 1916 the School opted to take up rugby in the Michaelmas term, a move which attracted considerable discussion but one which was almost universally deemed a success within a season. In 1919 hockey was introduced in the Easter term, almost apologetically, and made very little impact for several years. The first Old Cranleighan side took the field in December 1921 when they beat the School. Considering that the game had only been played for two seasons, that the old boys were able to raise an eleven was commendable. This fixture continued to be played each March. In 1926 Eric Abbott, a more than capable player who had already played for Surrey, responded to increased interest by arranging another game. When the OCRFC, who were the powerhouse of the OC Society, finally secured their own ground at Thames Ditton in 1927 the invitation was given to Abbott to try and start a full-time hockey club. 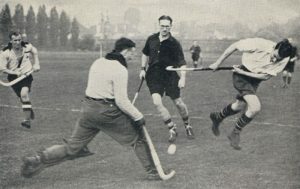 The first game of the official OCHC took place in 1928-29 when Spencer were held to a 4-4 draw. An indication of the struggle facing Abbott was that he could raise only nine players and had to borrow another two from the OCRFC. Nevertheless, the club was up and running and enjoyed a successful first season. Abbott led from the front with 62 goals, including 11 in the 18-1 defeat of Bromley – all three statistics remain as records to this day. In the 1930s the club continued to grow, albeit slowly and with a number of teething problems. A second XI was fielded for the first time in 1930 and the Pagans, a Sunday side, were formed by the tireless Abbott in the same year. But the battle to raise consistent, strong sides was a constant obstacle, especially as the OCRFC, very much the senior side, continued to cream off the better sportsmen. An attempt was made to start the 1939-40 season but after one game, a 2-1 win at Cheam, the increasing numbers of OCs joining the forces caused the Secretary to admit defeat and suspend operations. Thames Ditton was requisitioned by the army and the pitches ploughed up (which given the problems which had dogged the groundsman from the off was probably a blessing). Although the annual match against the School continued throughout the hostilities, the OCHC effectively went into hibernation for seven seasons. Action from the OC game at Cheam in October 1939, the last game before the club went into hibernation for the war. Despite the end of the war in 1945, normality did not return to civilian life for some time. Any thoughts of re-starting the OCHC were made almost impossible by the numbers of old boys still serving in the forces as well as the fact that Thames Ditton was still ‘occupied’. An arrangement was made with Richmond HC that any OCs wishing to play could join them for the season; behind the scenes Thames Ditton was gradually being returned to some sort of order. In 1947 the OCHC returned home and began their first full season in eight years. But the problems facing the club were enormous – the pitches were even worse than ever, the pre-war players were all long in the tooth and the younger players had no affiliation with the club. The most serious obstacle was the severe petrol rationing, which made away games a logistical and economic nightmare. The 1950s and 1960s saw little change take place either on or off the field. The club continued to field three sides, occasionally four, the highlight of the season remained the Easter festival at Worthing and a steady stream of new recruits from the School kept the numbers constant. In the summer of 1969 considerable time was given to discussions about whether the club should enter the new Surrey league which was being proposed. Despite considerable opposition from members who felt that it would mean the club losing traditional fixtures, the majority voted in favour. Things would never be the same again. The advent of league hockey in 1970 did not cause the collapse of civilisation as many in the club seemed to think it would. Although the new batch of fixtures meant some new opposition, many of our old adversaries had also joined the league. Below the 1st XI there was no significant change. Throughout the seventies the 1st XI stayed in Surrey Division One (indeed, they were neither promoted nor relegated for 24 seasons) without ever threatening to progress to a higher level. Once, in 1975-76 they found themselves in the top three going into February but a run of poor results towards the end of the season extinguished any hopes of promotion. Unfortunately the marked improvement in the standard of School hockey under England international Peter Freitag was not reflected in a consummate rise in that played at Thames Ditton. This was in no means a reflection on Freitag who did all he could to promote OC hockey, but more down to the poor pitches at TD and the comparatively low standard of the league we were playing in. As astroturfs slowly begun to appear and then National League hockey was introduced the gap between where we wanted to be and where we actually were widened. 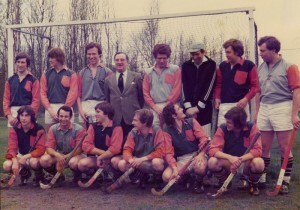 In the spring of 1978 the club celebrated its 70th anniversary with a special match against an HA XI. Whilst we retained our league status through the 80s the promotion challenges were few and the battles against relegation more frequent. In 1986-87 we had to win our last two matches to stay up. Having successfully won the first we were left needing to beat Surrey University, one of the better sides in the division. Tim Cook used all his cunning to repeatedly delay the match until offering our opponents a 10.00am Sunday fixture – the day after their annual student ball. Suffice to say only nine horrendously hung-over opponents turned up and were duly dispatched 6-0. When the School laid their own Astroturf in 1988 the 1st XI, struggling to attract any players to the delights of the grass at TD, upped and moved down to Cranleigh; within one season the 2nd XI followed suit and by 1991 only the 4th XI remained playing at TD. The 2nd XI had achieved promotion of their own in 1989 when they were promoted into the Surrey/Hampshire regional league. This came about after they finished sixth and four of the sides above them declined promotion. To their credit, and against the odds, they retained their place and remain in the same league to this day. The 3rd XI entered the newly-formed Surrey Open League in 1988. But the writing was on the wall as far as Thames Ditton was concerned. The OCHC committee formed a working group to try and work out the feasibility of raising funds for an astroturf pitch at TD, but the most likely future seemed to be a permanent move to the School. In reality the club played far more games at Cranleigh than TD, although the location of the School was a major obstacle to recruitment of new players, most of whom traditionally came from west London and north east Surrey. Numbers had fallen and we were struggling to field a fourth side. Then came two events which were to shape the future of the OCHC. In January 1992 vandals broke into the clubhouse and started a fire which caused substantial damage to the main body of the building. Secondly, an ancient OC died and left a substantial sum of money to the OC Society. After much deliberation the OC Society decided to invest the inheritance plus the insurance money into re-developing the OC Club. A £700,000 rebuild of the clubhouse allied to the laying of a new astroturf meant that in September 1993 the OCHC returned home, a scenario which 18 months before had seemed impossible. The predicted upturn in the club did not happen immediately after our return to the new Thames Ditton. In the first season back the faces were familiar and the results not brilliant, although for the first time in a decade the 1st XI challenged for promotion before having to settle for second place. The real change came in the second season back (1994-95) when a number of new players arrived on the scene, attracted by the outstanding facilities and the buzz about the club and where it was going. By the end of the season we were fielding four regular sides as well as the occasional Studio and Ladies XI; the Veterans continued to play on Sundays. At the end of that season we were left needing to beat Met Police (who were by this stage ground-sharing with us) to pip Barclays Bank, the leaders throughout, to win the Surrey title. By rights we should have already been pipped to the title as our original game against the Police had been abandoned 18 minutes from time after their goalkeeper was badly injured – the score at the time was 0-0 which would have handed the Bank promotion by one point. But in the replayed fixture we scored twice midway through the second-half and after 24 years we were up. There then followed four years where our success attracted new players and other older faces to return. In 1997-98, after two more promotions, we reached the quarter-finals of the EHA Cup, losing to national champions Cannock in front of more than 600 people at TD. We also lost in the final of the Surrey Cup but enjoyed another cup run the following season, adding several more National League scalps, as well as three seasons in the regional premier. But we failed to build on that through the club, and when that side began to unravel, we found ourselves in freefall, finally settling back in Surrey Division One, where we started a decade earlier. But we consolidated and bounced back with the 1st XI returning to South Premier. In 2012 the Colts section started and within six years more than 500 children were taking part every Sunday, and this in turn provided a boost to the senior sides throughout the club. By 2018 we were fielding seven men’s and five ladies’ sides as well as mixed teams and a vibrant Back2Hockey squad. 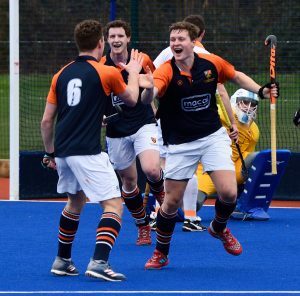 In 2018-19 the men’s 1st XI secured promotion to the National League, capping a memorable season which had started with a £450,000 investment in a new pitch and improved facilities.